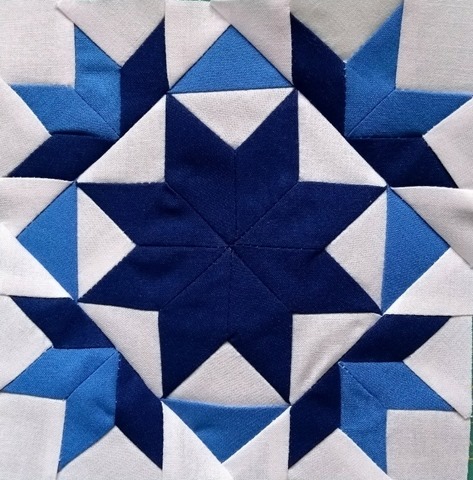 I’m getting close to the half way mark on the Loyal Union Sampler by Jennifer Chiaverini. 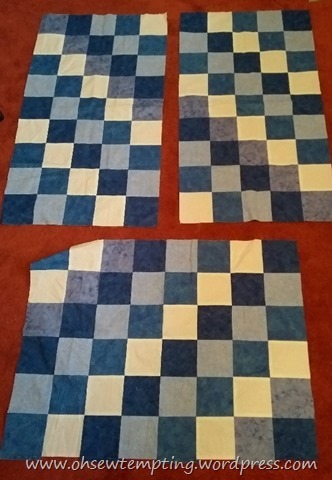 I’ve got another five blocks done which makes five completed rows so far. First up is Home Sweet Home. This one is called Honey Bee but the design in the book also has some appliqué. 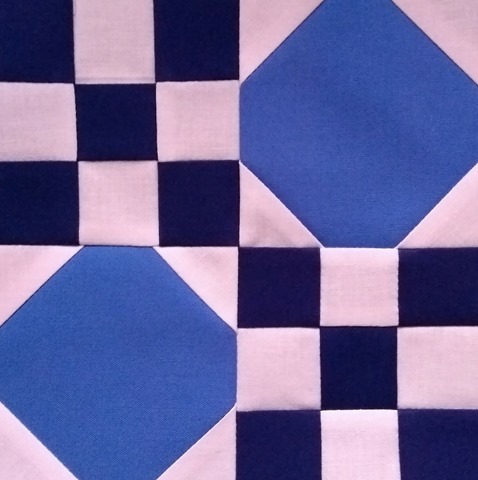 I’m not having appliqué in this quilt so I’ve taken the liberty to rearrange the colour values of the base block so it’s more to my taste. Now, I really like the next one which looks like a pineapple block variation but the construction is nothing like it. This is Illinois. The last one in row five is Improved Four-Patch. That’s 55 blocks completed so far. I’m getting there! 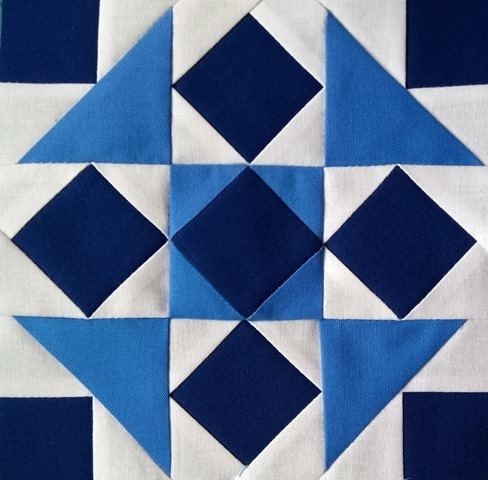 These blocks are from the Loyal Union Sampler by Jennifer Chiaverini. I’ve got another five to show today. The first one is called Granny’s Favorite. Not as simple as it looks but I enjoyed making it. This one is Guiding Star. Then Harvest Home. Lots of fiddly points to match here. It was nice to finish on an easy one called Hatchet. 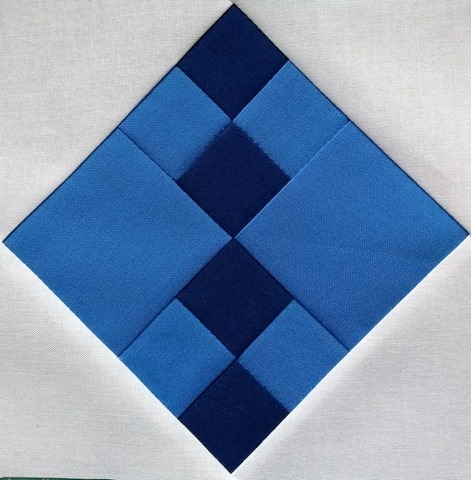 These blocks all finish at 6 inches square. 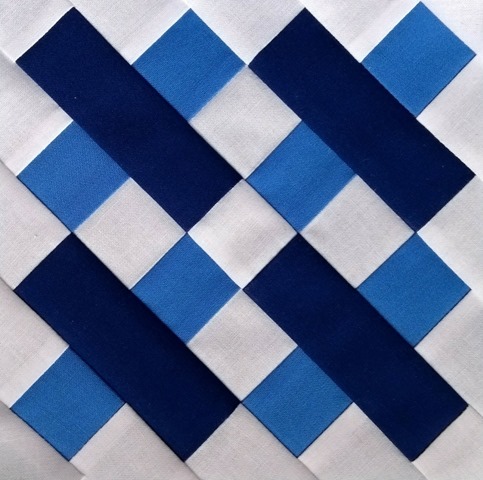 Have you made a sampler with small blocks? Or are you still in the process maybe? 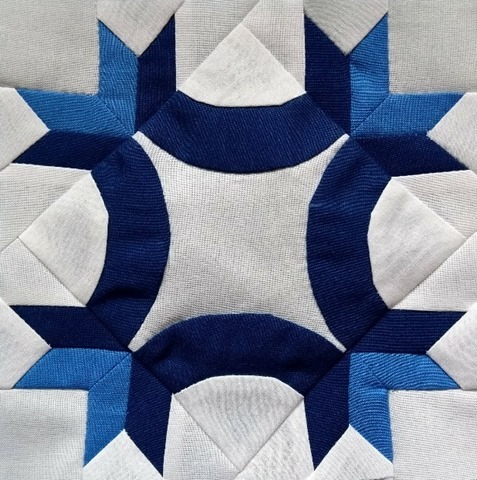 Five more blocks to share today from the Loyal Union Sampler by Jenifer Chiaverini. 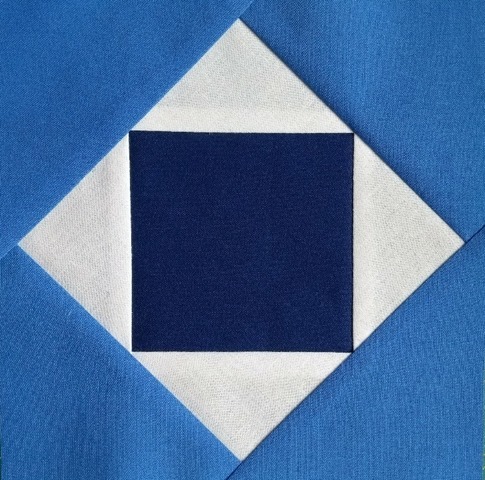 Nice and easy Friendship Square to begin with. Next up is Gerda’s Puzzle. I like this one a lot. The third one is Gettysburg. Last but not least is Good Fortune. Hurray, I’m onto the fifth row! 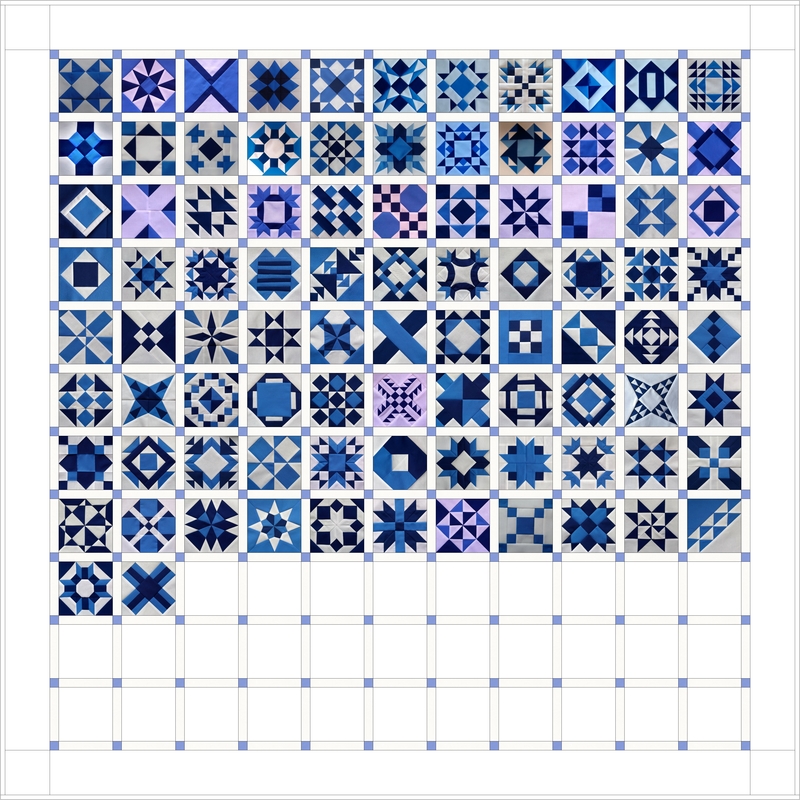 I’m really trying to put my head down with this project now and I don’t think I’ll start anything else (in patchwork) until it’s done. Part of me wants it all finished but another part doesn’t want it to end because I’m having so much fun with these tiny blocks. 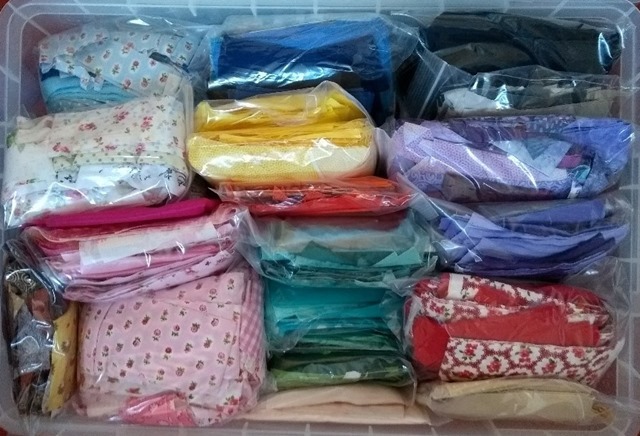 I like to keep my scraps organised by colour in polythene freezer bags, the ones that have a grip seal. I’ve got a couple of large plastic storage boxes to keep them all tidy but, now and again, I reach the point where I can’t fit any more of a particular colour in. Then it’s time to do some scrap busting! These are all the purples I had. 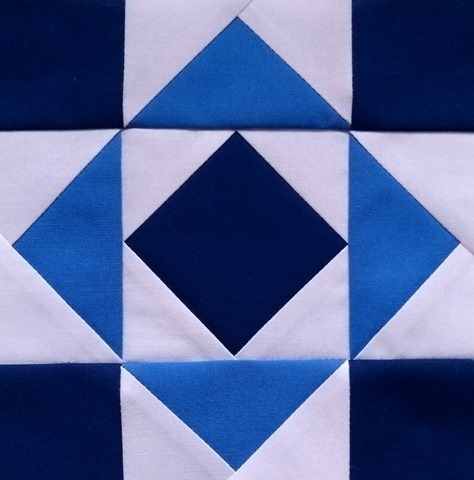 There’s a few pieces left over from the F2F quilt which was made as part of a block swap organised by Kate a couple of years ago. 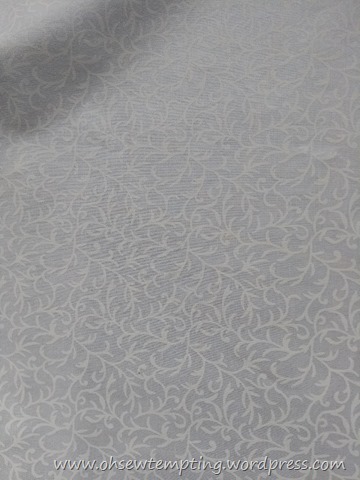 I remembered this particular fabric but I wasn’t sure it fitted in with what I’d planned. 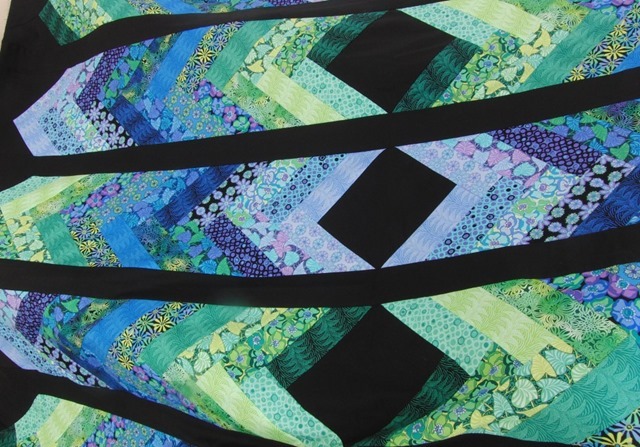 It’s from a very bright and cheerful jelly roll that I made a French braid quilt top with years ago. 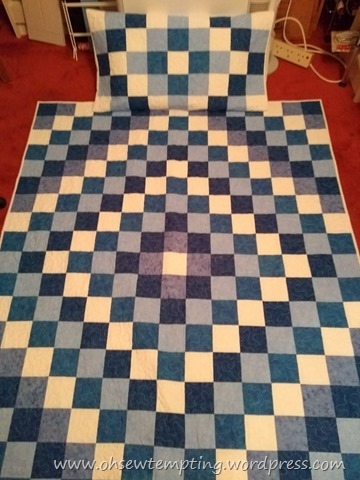 Here it is, still sitting in a box and waiting to be quilted after almost 6 years. Time flies! 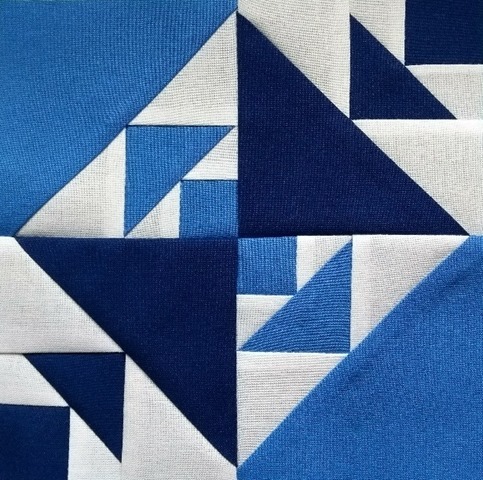 Do you always remember where every bit of fabric came from and the projects you made from it? I digress. 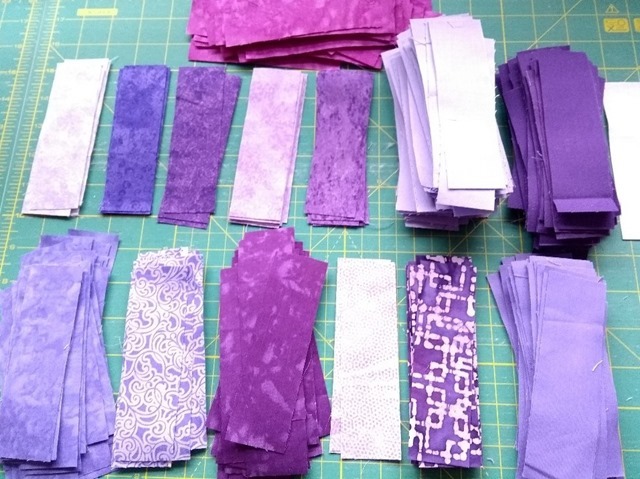 I pressed all the purple scraps and divided them into groups according to shape and size. 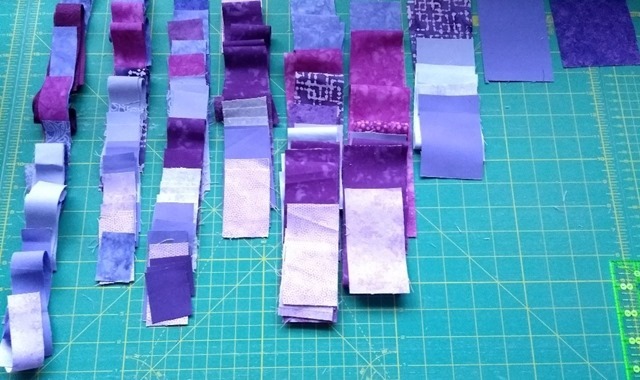 There were loads of 5 inch squares, part jelly roll strips and 5 inch rectangles with selvedges still attached. 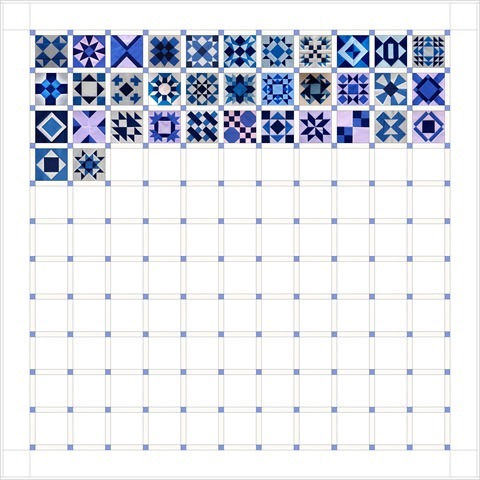 I’ve now cut the selvedges off and have ended up with over 200 rectangles that are 5” x 1.5”. 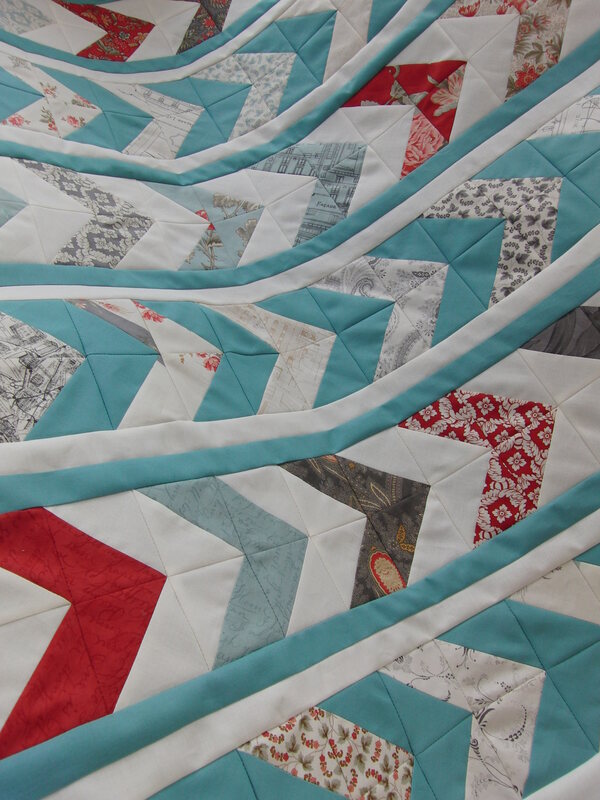 There’s also about 70 five inch squares and the equivalent of 60 full jelly roll strips. They’ve all been bagged up for future purple projects. 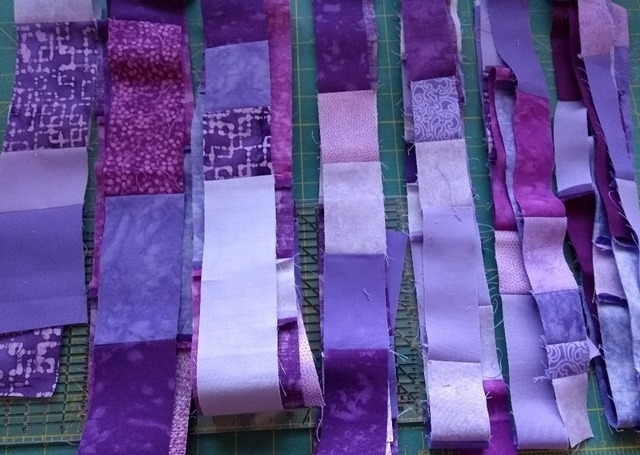 I then cut all the other bits into strips as wide as I could get from them. Then I stitched them all together. That’s what patchworkers do. 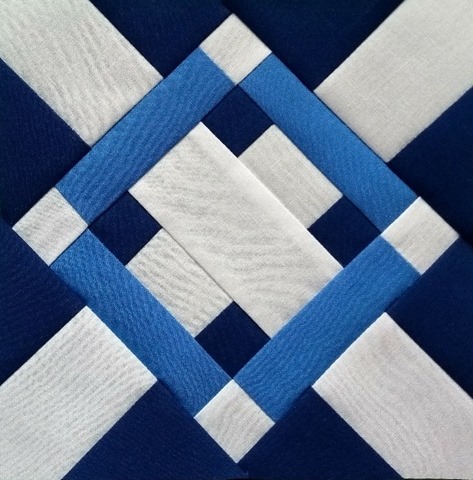 We chop up fabric and stitch it all back together again! 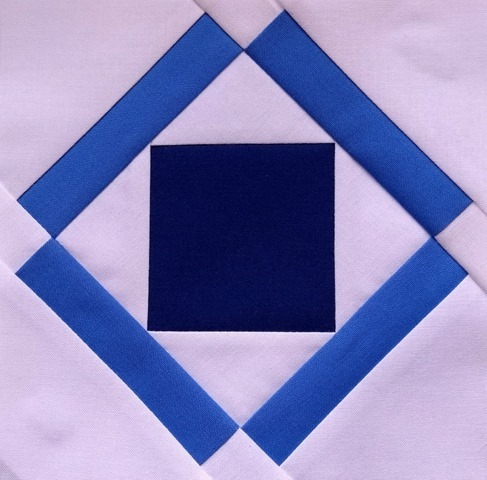 A bit of mindless sewing is good for you now and again, isn’t it? Then it was fun time! 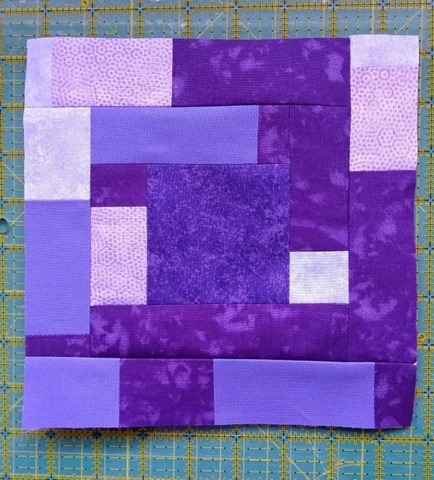 Why have lots of pieces of purple fabric when you can have one big piece instead? 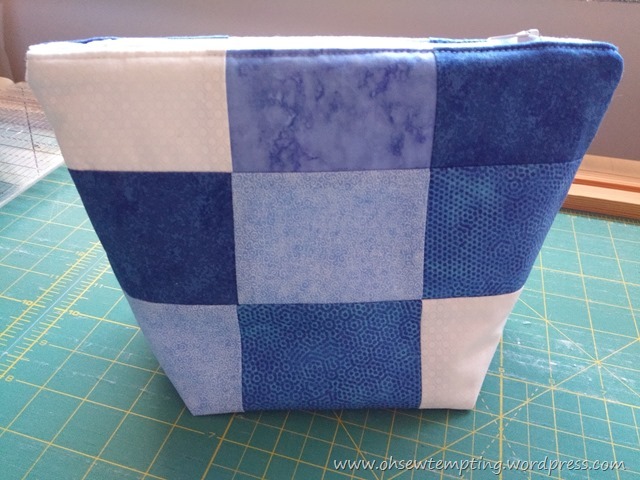 Keeping everything square as I went, I just kept adding different widths around and around and couldn’t stop because it was so much fun. 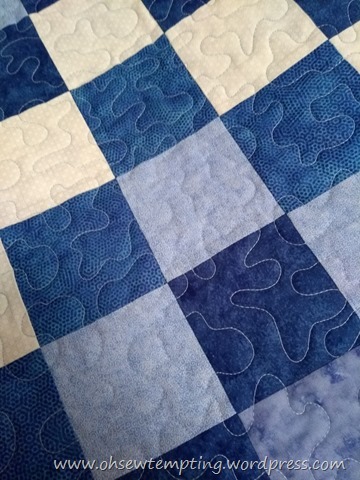 I pressed the seams open because there are no quilt police here I thought it would lie flatter that way. 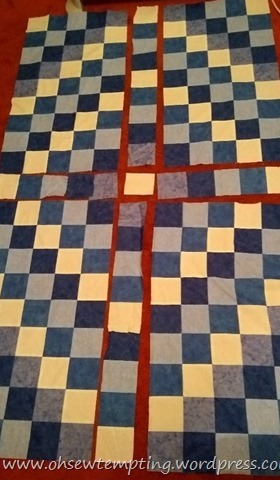 Sometimes I added a strip to each side rather than all the way around, depending on how much of that width I had left. 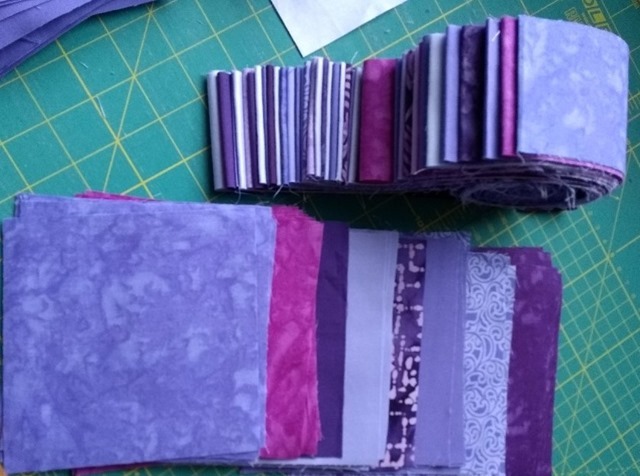 I ended up with purple scrappy madness. 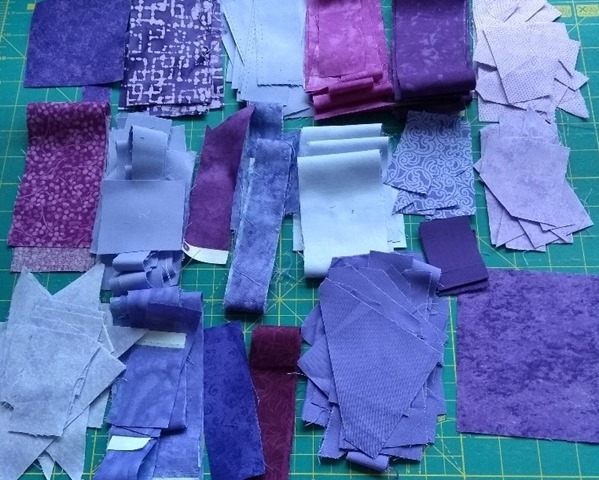 It’s a good job I like purple ;-). 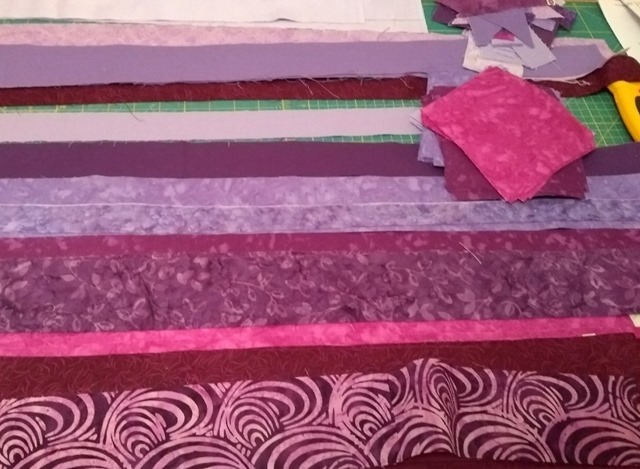 It’s now about 36” x 24” and I have no purple scraps left. Any ideas what to do with it? I’m happy to leave as it is or chop it up. Don’t say “bin it” LOL. 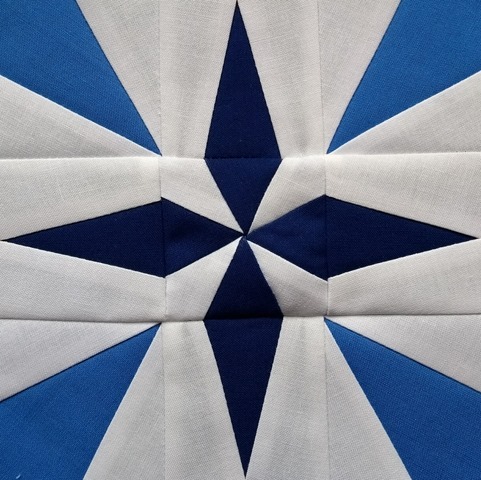 Here I go again with the latest batch of 6 inch blocks from the Loyal Union Sampler. They all come from the book by Jennifer Chiaverini. First is Everett’s Oratory. I have to admit I almost tore my hair out with this one. 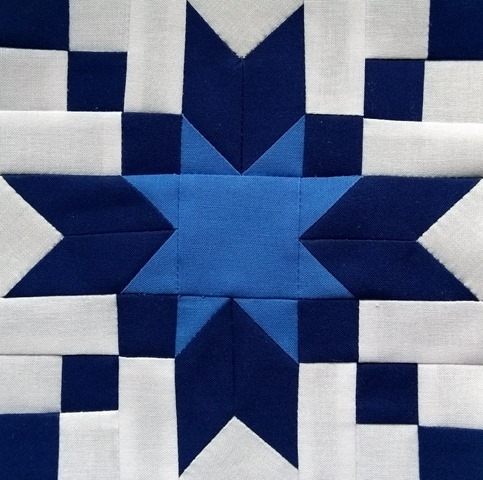 It has 56 pieces and lots of Y-seams that had to be hand stitched because they were too tiny to put under the machine foot. I had several names of my own for this block but I don’t think it would be wise to publish any of them! Anyway, I got there in the end. It’s all about the challenge isn’t it? I had a huge sense of achievement when it was finished. Next up is Farm in the Valley which isn’t as wiggly as it looks here. Then it’s Fond Farewell. I like this one. So simple, yet so effective I think. Finally, I took a liberty with this one. 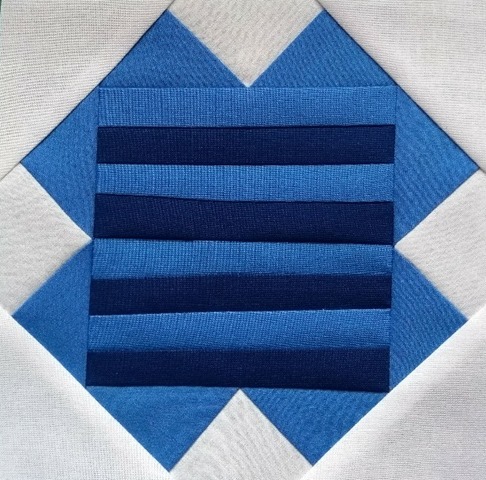 It’s called Friendship Knot and the curved sections are supposed to be appliquéd. 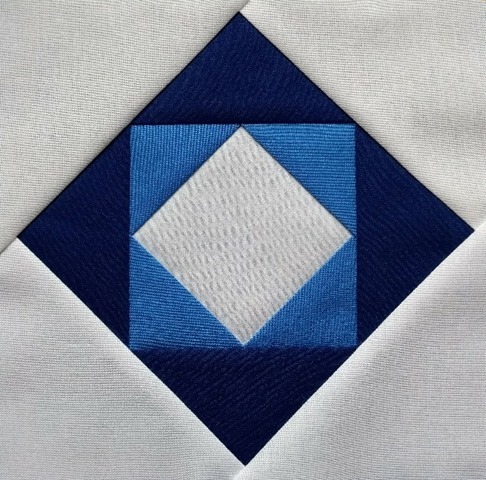 I don’t want any appliqué on this quilt so I made my own pattern templates and machine pieced it instead. It was fiddly but doable as you can see. 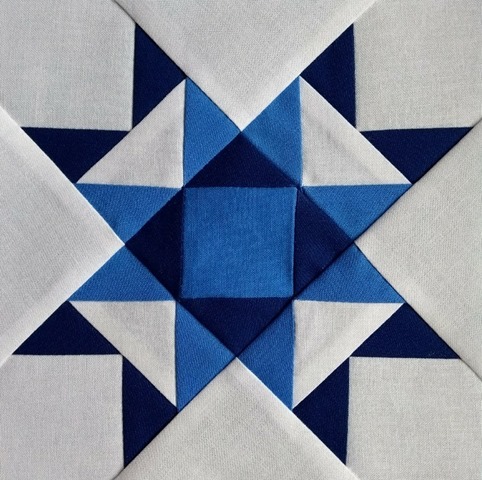 By the time I’ve done the next block I’ll be one third of the way to a finished quilt top. 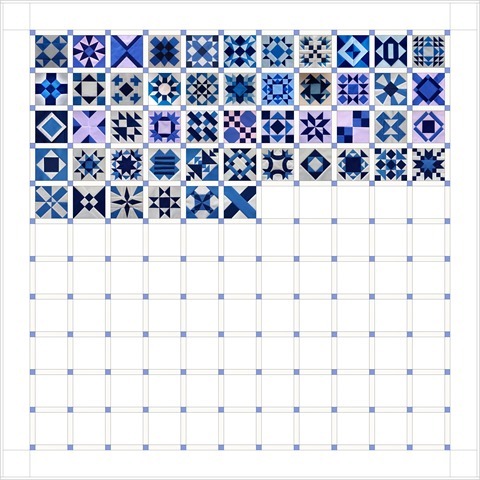 Here’s the virtual quilt so far. 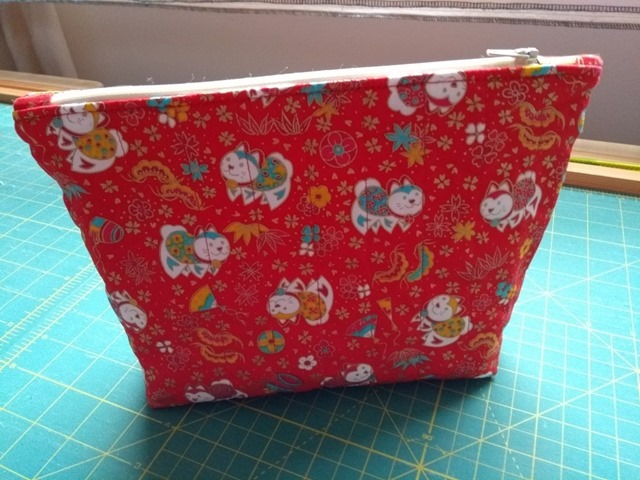 I was playing with the Singer and I rather enjoy making bags so I made another one! 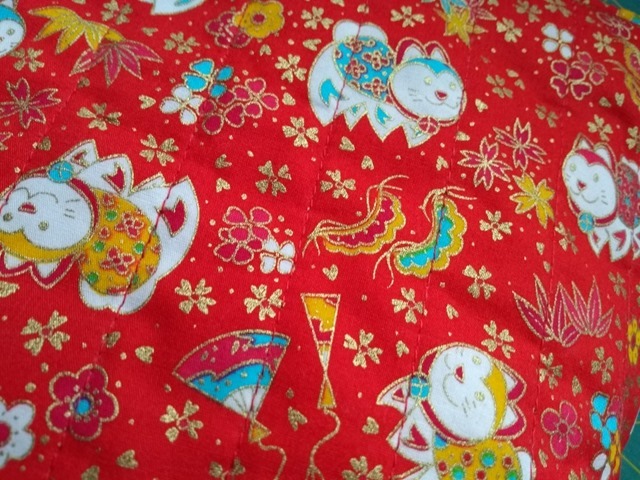 This time with the red lucky cats fabric that my daughter purchased for me when she was in Taipei. 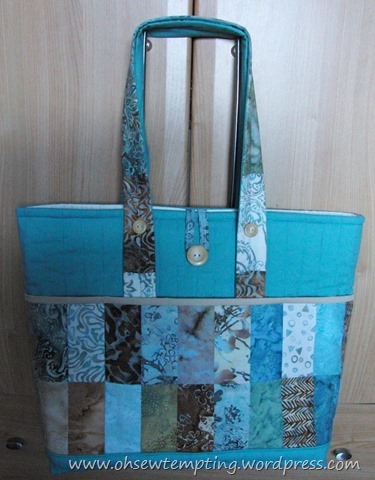 It’s the usual make-it-up-as-you-go-along kind of bag, lined with Moda red solid and a zip closure. 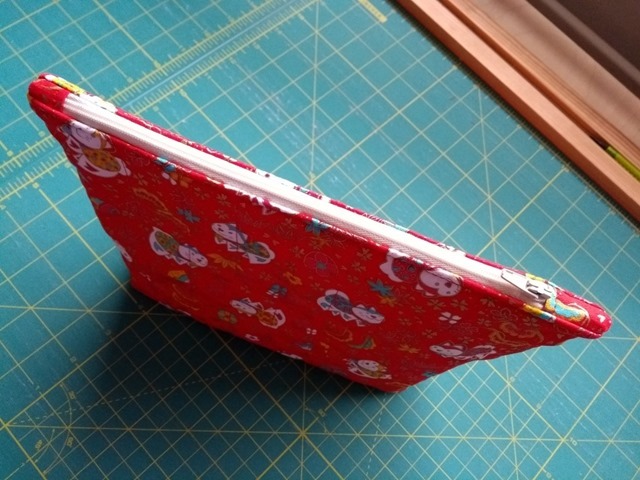 …and gave it a bit of a boxy bottom. 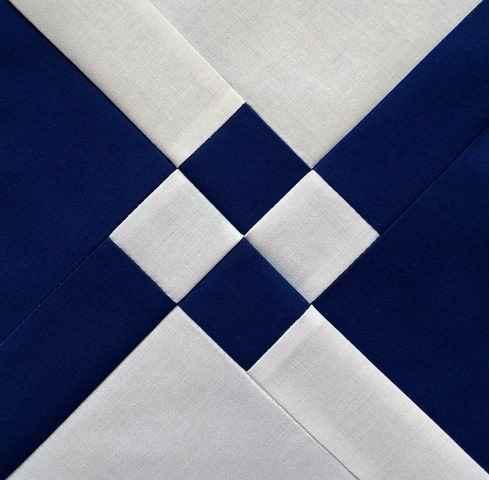 The singer has no problems quilting without a walking foot. 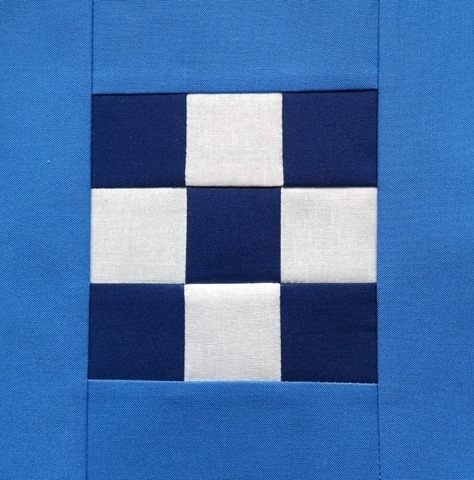 I just made the stitch length a little longer as if it was for top stitching. 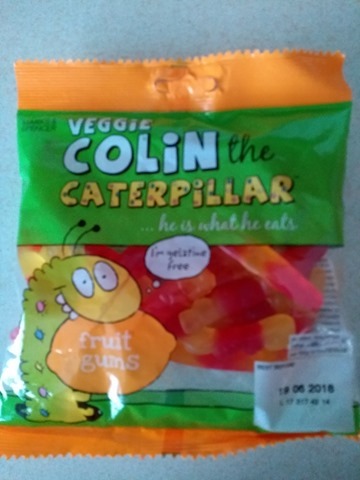 The bag has now been gifted, along with an easy peasy scrappy bookmark (because the recipient likes to read proper books) and some veggie gummy caterpillars from Marks and Spencer. Nom nom! I should have bought myself some of those ;-). Too late now. 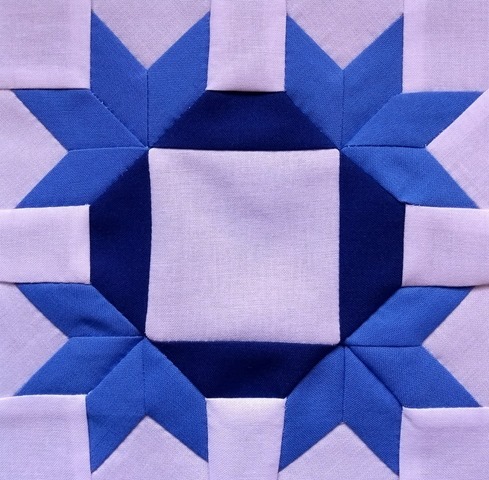 Another five blocks completed for the Loyal Union Sampler from the book by Jenniefer Chiaverini. First up is Double Four-Patch. A nice easy one to start. Next is Double Z. I quite like this one. This one is Economy. Quite an easy batch so far. Finally for today is Emancipation. I really enjoyed making this one. 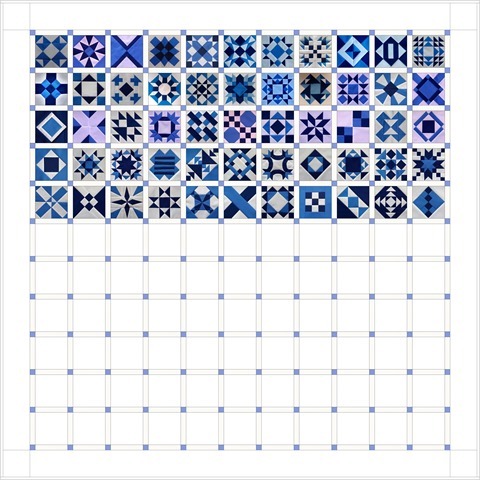 All the blocks finish at 6 inches square and will end up in a quilt like this virtual one. I hope you’re all getting lots of time to craft today. 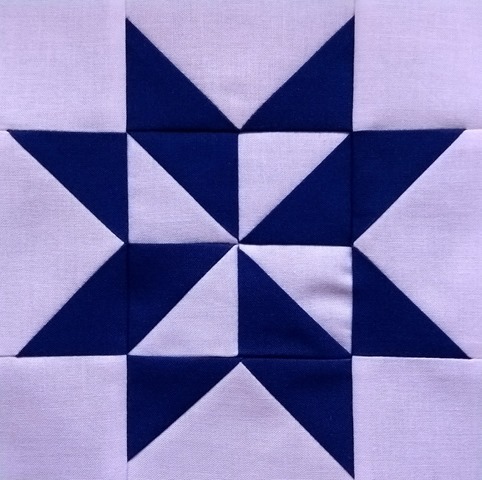 Keeping on with The Loyal Union Sampler from the book by Jennifer Chiaverini. Number 26 is Crossroads. 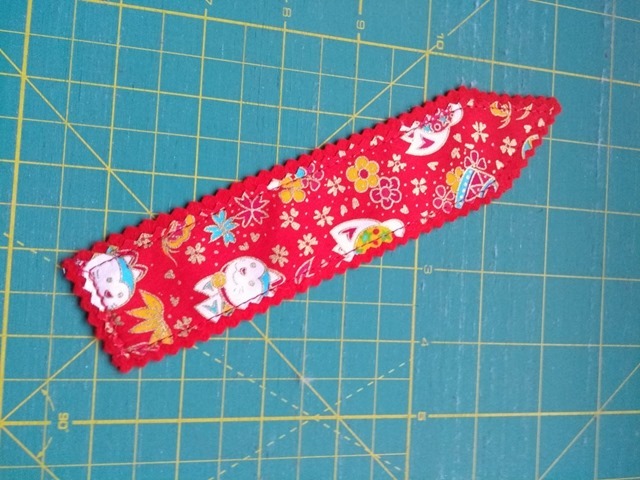 I had to hand stitch some of this one as it was too small to get under the machine foot for the Y-seams. This one is called Cross Stitch. Next up is Delaware Flagstones. Now for Democratic Watchman. Strange names these blocks have! Finally for today is Diamond Star. 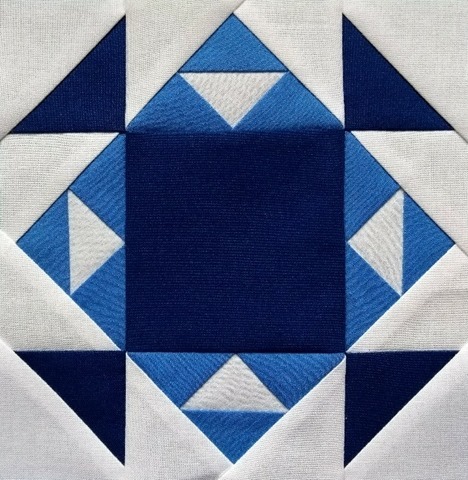 If you like making small blocks, this is a good project to take on. They’ll all finish at 6 inches square. 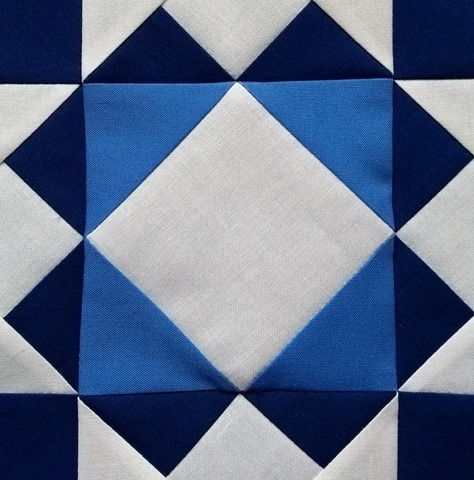 I’ve been busy on this quilt for far too long so I’m going to focus a bit better and motor on over the next few weeks. 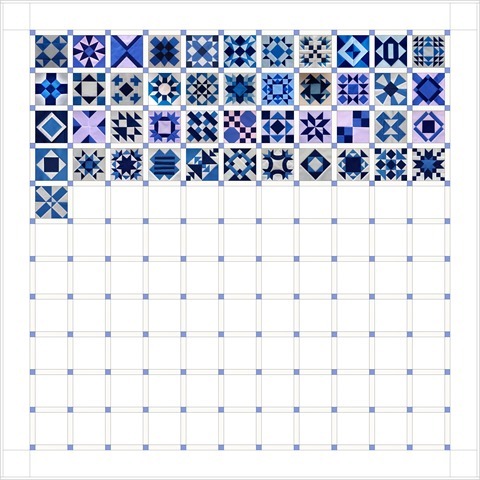 Here’s all the blocks so far. 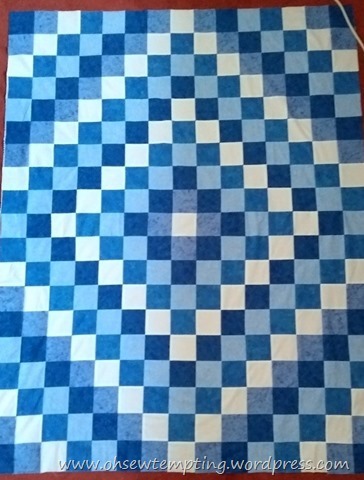 Last time I showed you the Trip Around the World quilt that my sister started and then I finished for her when she ran out of enthusiasm. 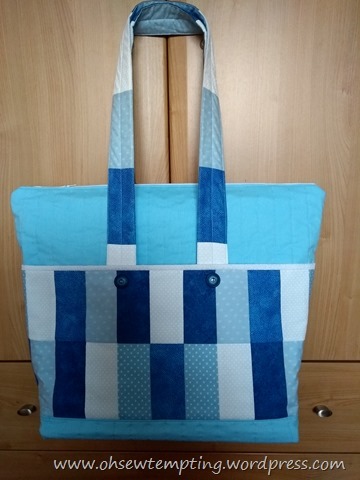 You might also remember this knitting bag I made for her over three years ago that she uses all the time (but not for knitting). Some of my other bags, including this one, are here if you’re interested. 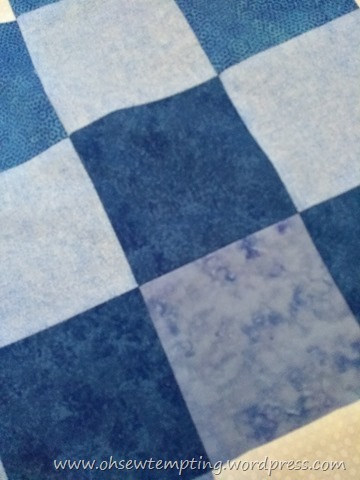 Well, I had to do something with all the scraps that were leftover from the quilt. I’d come to the conclusion that the reason my sister didn’t want to use the original bag for knitting was because I didn’t make it with a zip closure. She doesn’t like spiders and I realised spiders could get into the knitting and that wouldn’t be good would it? She just kept saying the bag was too good to use for knitting but I still think it was all to do with pesky spiders LOL. So I made a new one with a zipper in the hope that she’d use it for knitting this time! It’s almost the same as the original but with a much wider base, it closes with a zip and the button placement is different. Those buttons are from my late Aunt Edith’s sewing box by the way, probably circa 1960’s. Even though it looks similar, the construction method was completely different and, to be honest, it had me stumped for a while but I got there in the end. It’s all in the planning isn’t it? The original started with a one piece base and the sides were attached to it. For this one I needed to rethink because of the zip. 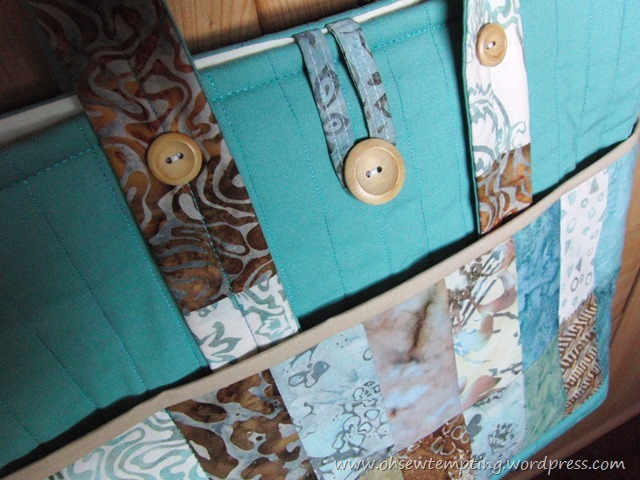 I started at the zip and then attached the sides, so working down the bag instead of up. 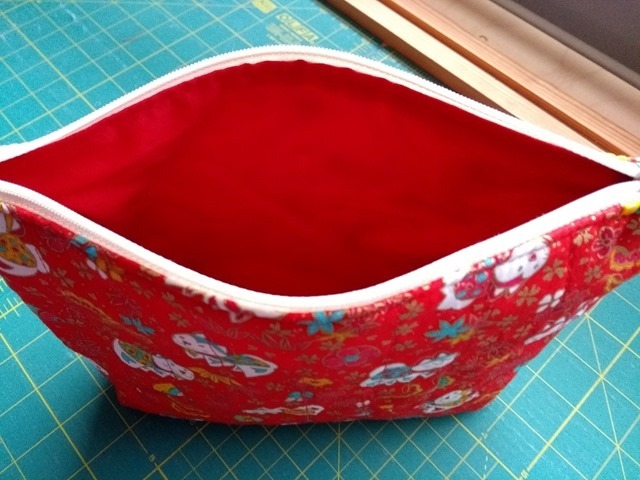 There were still a few scraps left so I made a little pouch to pop inside as well. My sister was well chuffed with both. I told her the large one was for her knitting. She has other ideas. I might have known! 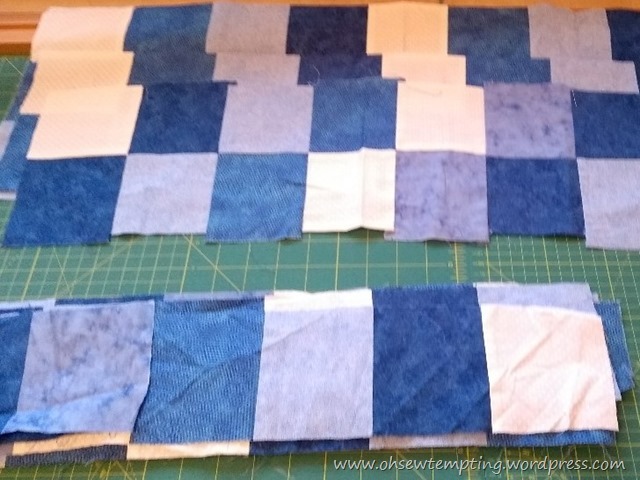 Anyway, that’s all of the blue Trip Around the World fabrics used up now. 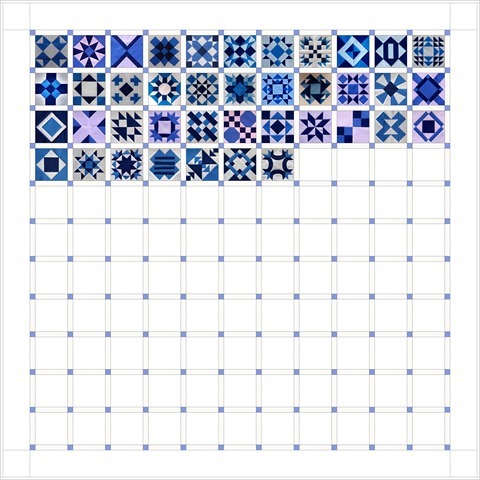 I’ve also been plodding on with the Loyal Union Sampler blocks recently and have a few of those to photograph. 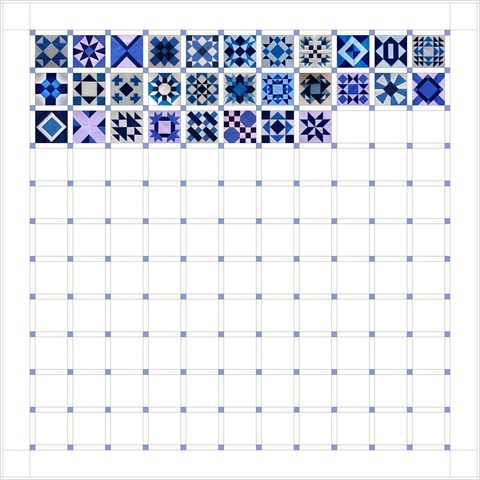 Then I’ll get the virtual quilt on the right of the page updated so you can see where I’m up to. What crafty stuff have you been up to recently? My sister’s been having a clear out which ended up being great news for me. 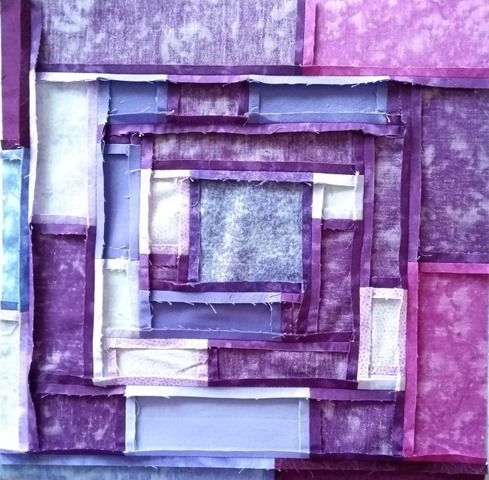 I can’t remember how many years ago it was, but she started to do patchwork at a class which resulted in a fabulous first quilt. She was very enthusiastic about starting another one so we went to the fabric shop together to choose lots of blues for her solo adventure. 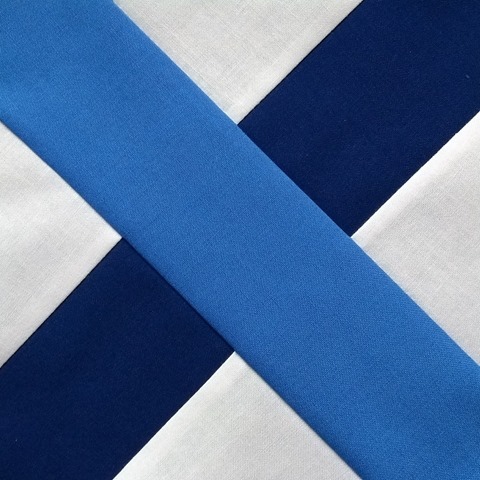 The pattern had already been chosen, as had the method of construction. 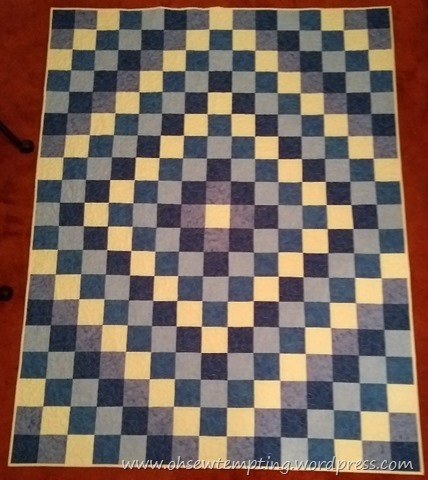 It was going to be a Trip Around the World quilt made using the tube method. 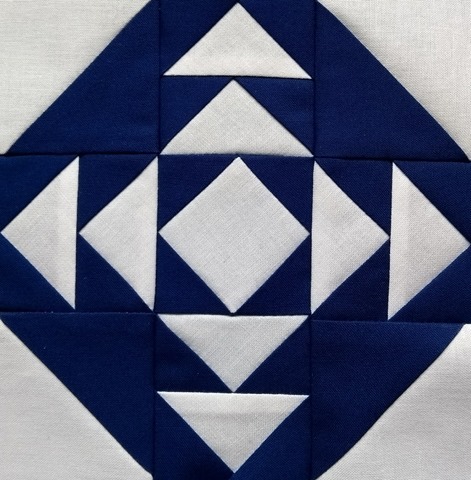 All went well initially but her enthusiasm soon waned and that was the last I heard of any quilt progress. Unfortunately it had made its way into the cupboard to be forgotten. Every now and again, I’d ask her when she was going to get the quilt bits out of the bag and have another go. She kept saying it would get done one day. It didn’t. Eventually, I offered to finish it for her. Those fabrics were pricey and far too good to just sit in a cupboard. I was convinced she’d thrown it all in the bin! However, I was so pleased when she handed me the bag just after Christmas. There were lots of bits. 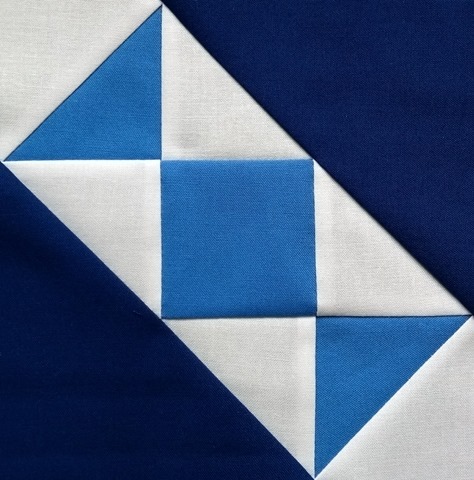 The top two rectangles are exactly the same if one is rotated 180 degrees. The bottom one is completely different in both size and colour. 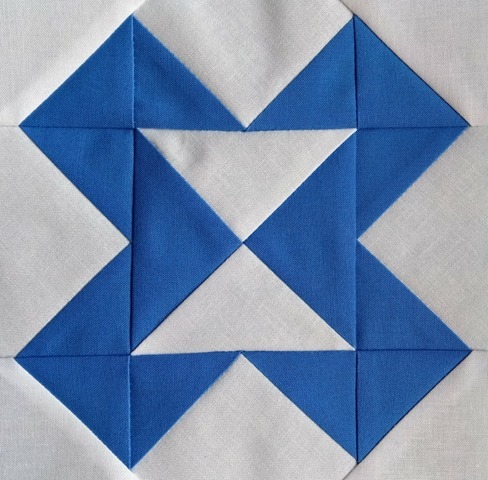 I couldn’t make head nor tail of the pattern so I ditched it. Then it was just a case of solving the puzzle of all the bits. 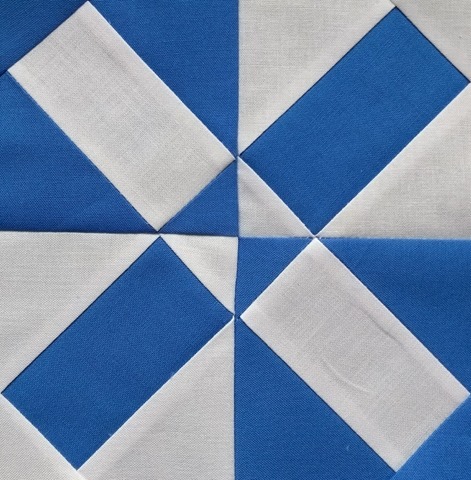 The good thing was that my sister had pressed all the seams correctly and her piecing was perfect so far. 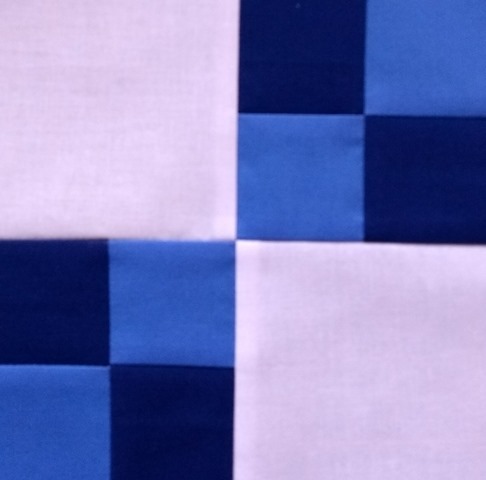 …but there was still loads of fabric left so I joined more strips and made it wider. 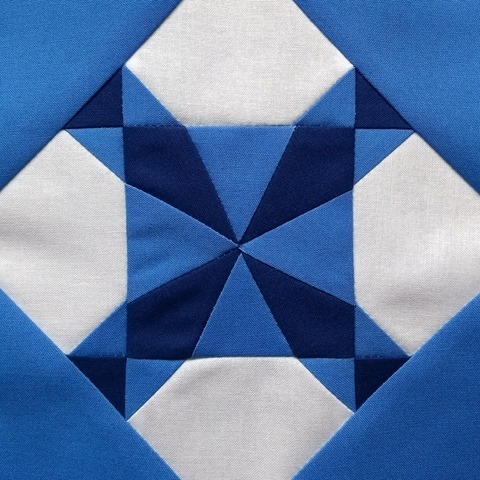 …and kept the quilting simple. Not a brilliant photo but you’ll get the idea. 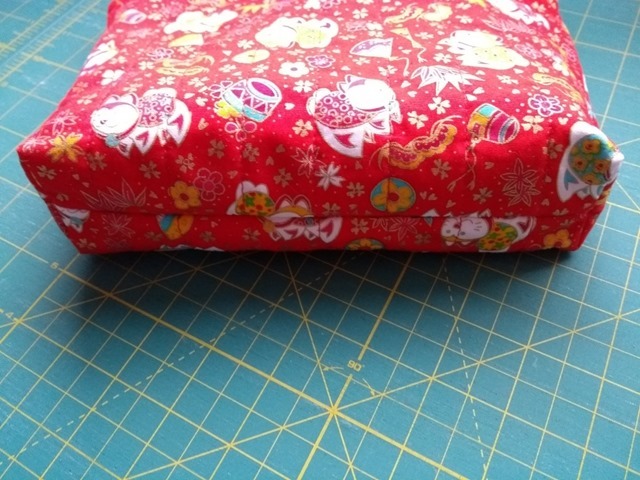 It turned out to be a good sized single to flop over the sides of the bed or it would make a nice double topper. My sister loves it but she no longer has a colour scheme in any room to match. So it’s mine! That’s the good news 🙂 I’ve got a single bedroom with white walls and it works a treat in there. However, I couldn’t stop there because there was still plenty of fabric left. 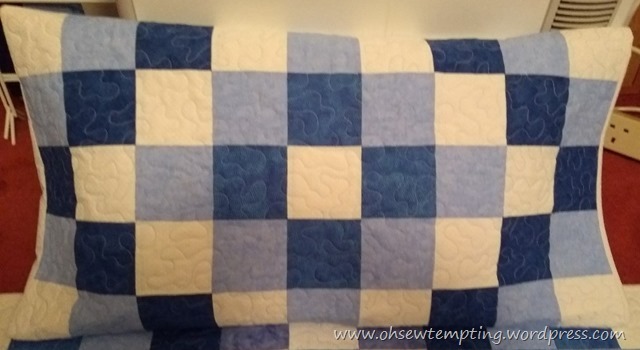 I made a quilted pillow sham. I should have made more effort with the photography but here’s the finish! I think it would have been so much quicker to start this one from scratch but my sister had spent a lot of time cutting and piecing and I had loads of fun sorting out the puzzle. 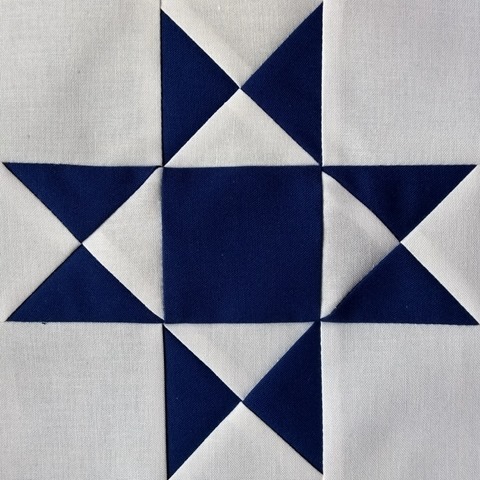 Have you ever finished something that someone else had started? How did it turn out?